May is considered National Bike Month by the League of American Bicyclists. Personally, I prefer to consider every month Bike Month. Yet the association of May with bicycling is widespread, and many organizations focus on biking in a myriad of ways during this month. As part of their efforts, they have encouraged several local businesses and organizations to offer discounts on their products and services to customers who use a bicycle for transporation. Many of these offers are specific to Bike to School Day on May 6 or Bike to Work Day on May 15. 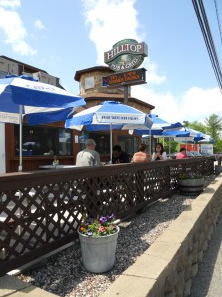 Hilltop Pub & Grill is offering half-price appetizers to those who bike to their restaurant between May 1 and May 17. Zest is offering a free treat with the purchase of a cup of coffee to those who ride on Bike to Work Day May 15. Stevens Point Co-op is offering a free treat to students biking on Bike to School Day May 6 and commuters biking during Bike to Work Week May 11-15. Stevens Point Transit is offering incentives to multimodal bike/bus riders during Bike to Work Day May 15. For the full list of businesses and organizations offering discounts, visit the GoPoCo webpage. You’ll also find information there about other local establishments that support bicycling. If you are a business owner who wants to offer discounts to your bicycle riding customers, you can arrange to have your business added to the GoPoCo webpage by contacting Tom Wetter at tom(dot)wetter(at)uwsp(dot)edu. And if you are a Poky Pedaler who wants to take advantage of these discounts, then visit the GoPoCo webpage and plan your month of May around riding your bike to all the great local establishments listed there.